We would not do this work. Our mission is to do our best to reduce suffering, find better ways to reduce suffering and share what we know with others so that they can do it. MOTIVATED BY THE PASSION TO SAFELY REDUCE SUFFERING, WE ARE ALWAYS OPEN, CURIOUS AND EAGER TO LEARN. FROM SINGAPORE TO HONOLULU TO BOSTON TO ATLANTA TO GENEVA, WE HAVE GONE EVERYWHERE IN THE WORLD WHERE WE COULD LEARN THE BEST PRACTICES AND ADVANCED METHODS FROM BRAIN SCIENTISTS AND OTHER CLINICIANS. 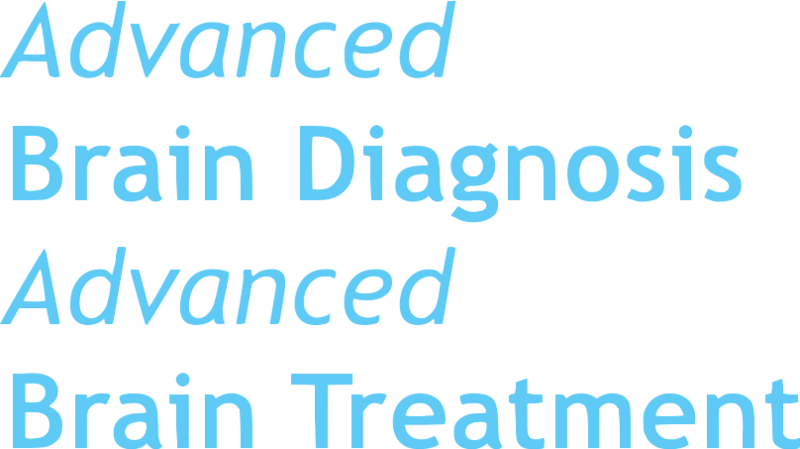 IF YOU FIND A CLINIC ANYWHERE IN THE WORLD THAT OFFERS 5 POINT QUANTITATIVE DIAGNOSIS, ADVANCED TMS AND 5 DIFFERENT KINDS OF GENTLE ELECTRICAL STIMULATION, PLEASE EMAIL US, WE WILL GO AND LEARN FROM THEM IF THEY LET US. IF YOU ARE OR KNOW ANOTHER CLINICIAN WHO IS INTERESTED IN LEARNING WHAT WE DO AND HOW WE DO IT, EMAIL THEM. WE WELCOME OTHERS TO COME AND LEARN FROM OUR EXPERIENCE. OUR GUIDING PRINCIPLE IS COMPASSION AND DIAGNOSTIC EVIDENCE BASED TREATMENT, BUT WE ALSO UNCONDITIONALLY SHARE WITH OTHER DOCTORS AND STUDENTS OF CLINICAL NEUROSCIENCE AND EXPLORE UNDAUNTED THE FRONTIERS OF PARAMETER SPACE FOR THOSE THAT HAVE FOUND NO EXISTING TREATMENT EFFECTIVE. American Brain Stimulation Clinic may be the first comprehensive outpatient brain stimulation clinic and may provide the most technologically advanced psychiatric and neurological treatment available. in addition to rTMS (magnetic brain stimulation) we offer five kinds of electric brain stimulation (tACS/CES, tDCS, Trigeminal, tVNS and urTENS), deep TMS, individualized frequency stimulation, theta burst stimulation and HRV (heart rate variability) measurement. As far as we are aware are the first and only center offering the frameless stereotaxic neuro-navigation technology in southern California outside of Los Angeles and San Francisco and the first in the Nation to provide TMS with the three newest and most advanced systems, MagStim, MagPro and NeuroSoft. Depression, Anxiety, Mood swings and Irritability as well as High or Low levels of Dopamine, Serotonin and Norepinephrine activity. Personality Style is a set of patterns of thinking, feeling, or behaving in different situations. Personality Style is made up of Temperament and Character. Temperament is what is pre-programmed either genetically or by early effects on the brain or both. Character is the set of learned abilities which a person may or may not have developed. Problems of temperament tend to need treatment with medication or brain stimulation but problems of character require some combination of psychotherapy, self directed informed change and or brain stimulation. 3) ability to rise above oneself, see the big picture, take a universal perspective, and not take things personally (Self Transcendence) . Low scores on the first two (S & C) predict the presence of a problem (personality disorder). Subscales of character as shown above can be useful also. Precisely identifying the problem can guide psychotherapy and provide measurable goals for treatment. If a person has a style that impairs function or bothers them it is called a personality disorder. This is an enduring and inflexible pattern of long duration that causes distress or impairment and are not caused by addiction or a psychiatric disorder. The conventional diagnosis of personality disorder was categorical which has come to be understood as less nuanced and valid compared to a dimensional one. We use dimensions. "The New Personality Self Portrait Questionnaire: Why You Think, Work, Love and Act the Way You Do" by Oldham & Morris. We have recommended or given this book to hundreds of patients over the years. Although it was meant to be used for self assessment and personal discovery and growth, we have found it to be equal enough psychometrically to the PDQ (Personality Disorder Questionnaire by Stephen Hyler, MD) and the SCID-P (Structured Clinical Interview for Diagnosis of Personality, Michael B. First MD). Because The New Personality Self Portrait Questionnaire is a book, written with the experience wisdom and compassion of the authors with separate chapters for each style it permits a person to learn more on their own which seems to be an advantage over the other two questionnaires. Our measurement of personality is not definitive, it is a screening method which must be confirmed by clinical observation and inquiry. We obtain a comprehensive set of symptoms including those which are criteria for Major Depressive Disorder, Bipolar Disorder, Schizophrenia, Insomnia and Sleep Disorders, Eating Disorders, Post Traumatic Stress Disorder, Generalized Anxiety Disorder, Panic Disorder, Social Anxiety Disorder, Obsessive Compulsive Disorder, Somatoform disorders, Addiction and Alcoholism. We are informed by the DSM method, but not limited by it. The authors have come to understand that there are essentially no valid categories of disorders but a spectrum of conditions. Our method therefore, measures many symptoms, but counts them not in order to categorize but to give a perspective on the nature and severity of the condition. In addition to the standard mental status exam, we use three quantitative measures. These help us understand a person initially and then measure progress. State measures are a way to understand how a person's current condition: esp about emotion(s). Heart rate variability measurement provides useful information to understand (Autonomic) Nervous System balance and keep track of progress. EEG was invented more than 100 years ago. In 2013, an EEG test to help diagnose ADHD (using the theta/beta ratio) was FDA approved. Also, several published studies suggest that for several psychiatric conditions, measurement of "individual alpha" and stimulation at that frequency is more effective than stimulating everyone the same way. EEG Brain imaging shows overall brain activity as measured at the scalp. The circles show a head, nose at top, and where there is more (red) or less (blue) brain waves. Fourier Tranfsorm permits examination of different frequencies between .1Hz and 50Hz. Each line above represents the power of the spectrum at one electrode site. Some people have a clear individual peak alpha frequency (left) and others not so much (right). 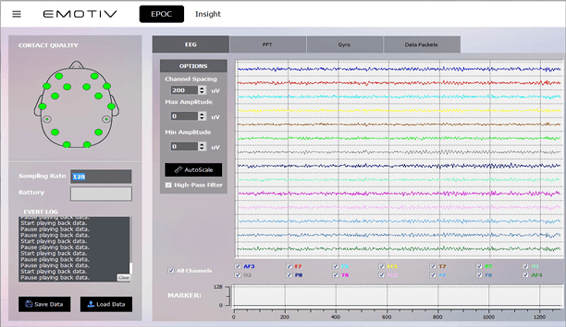 The above images were from data analyzed in EEGLab/MatLab acquired with Emotiv EPOC. The Emotiv system (above) is wireless and can be used to obtain brain wave data for further analysis. The NEBA system below, uses wires to carry the signal to the computer and the data is automatically sent to NEBA who analyses and sends back a report. This report refers only to ADHD and includes the Theta/beta ratio. Sometimes, depending on the situation, we will request treatment records, laboratory results, imaging studies (X-Ray, CAT scan, MRI, SPECT scan etc) and possibly Neuropsychological testing. If these are needed, they will be obtained, if you have any of those and can conveniently bring them in on the first visit, you are welcome to do that. However, getting in for the first appointment, should not be delayed by this. Come as you are, the sooner we start - the sooner you feel better. 90-95% of the time, we do not need prior treatment information from other sources, our system is designed to get the most information from the current status - as you are. Everything is as confidential as the law allows, and nothing will be released without your request and permission.